Anderson is fiercely motivated by a desire to not only gain influence, but respect within his peer group; measuring exceptionally high in social-orientation relative to league norms. Notice the use of the word stern in that second statement as well. Anderson is a natural leader in many ways - fearless, aggressive, accountable - but, had to adjust that all out attitude to the notion that he was no longer at the top of the food chain. Dallas' combination of accomplished veterans and viable role opportunity for its youth provided a great forum for Anderson. He was eventually able to lower the RPMs to a level where he could earn that prove myself shot by aligning his intensity with the proper avenues to apply it to. Having established that important foundation, Anderson is now in a position to build off of it. There is an intriguing mix of younger talent with a wealth of offensive role-responsibility up for grabs, which presents chances to climb the ladder. 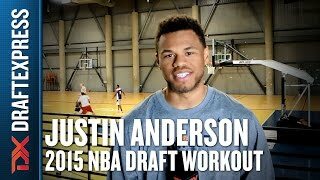 An interview with Justin Anderson featuring footage from his pre-draft workouts with Joe Abunassar in Las Vegas at Impact Basketball. Over the last two seasons, few teams in the country have been as stout defensively as Tony Bennett's Virginia Cavaliers, finishing 5th in the nation in defensive efficiency in 2013-14 and 1st in the nation this past season. A big part of that defense has been junior Justin Anderson, a physical specimen capable of guarding multiple positions for the Cavaliers. At 66, with long arms, good quickness, and a well developed upper body, Anderson has quick enough feet to defend wings on the perimeter and enough brute strength to defend smaller players in the post. That outstanding physical profile forms the basis of his productivity on the defensive end, and plays a big part in his value as a prospect. He has very quick lateral mobility, and changes direction very well on the defensive side of the ball. He also has a long, 611 wingspan and great closeout speed, helping him recover to contest shots, both on the perimeter and at the rim, when he does get beat. Anderson's defensive fundamentals are not always perfect, but his outstanding physical tools and high energy level help cancel this out, suggesting Anderson has even more room to grow as a defender than the already plus defender that he currently is. Anderson's defensive metrics are relatively pedestrian for a guy of his physical tools, averaging only 1.0 steals and 0.9 blocks per 40 minutes, pace adjusted. Part of this could be the result of head coach Tony Bennett's pack-line defensive philosophy, which places a high emphasis on playing the gaps and denying driving lanes. Pack-line, which gets its name from an imaginary line a couple of feet inside of the three point line, which is sometimes taped onto the court during practice, dictates that nobody, besides the defender guarding the ball, should extend themselves beyond the line. The philosophy has produced some of the best defensive teams in the country over the last few years, with Virginia's adjusted defensive efficiency ranking in the top-6 in the nation 3 of the last 4 seasons, but it's a philosophy that doesn't tend to produce a lot of steals: Virginia, despite generally being one of the top defensive teams in the country, has ranked within the top 150 in the nation in terms of steal percentage only once since Bennett's arrival in 2009-10, and that was a rather pedestrian 97th in 2011-12. Anderson's defensive tools have had him on the NBA radar for some time, but it's been his improvement on the offensive end, and specifically in his perimeter shot, that has him in discussions to be a first round pick this June. After shooting only 30.3% and 29.4% in his first two seasons at Virginia, Anderson made 47 of his 104 three point attempts during his junior season, good for an excellent 45.2% from three point range. According to Synergy Sports Technology, Anderson's overall effectiveness on jump shots increased from 32.1%, good for 0.854 points per possession and a 43rd percentile ranking, to 39.8%, good for 1.146 points per possession and a ranking better than all but 10% of his peers. That included improvement both on jump shots off the dribble (up from 25.8% for 0.548 points per possession to 37% for 0.889) and, especially, from the catch, where he connected on an outstanding 43.7% of his shots, yielding 1.322 points per possession, a number which places him in the top 7%. Beyond the sheer numbers, the form on Anderson's jump shot has improved dramatically, and was obviously a major point of emphasis for Anderson and the Virginia staff over the offseason. Everything from his footwork, to pre-shot preparation, shortening his motion, a tighter shooting pocket, and a more consistent release point has combined to form a much more consistent, accurate shooter from the perimeter. The rest of Anderson's offensive game is relatively pedestrian, with large parts of his offense coming in off the ball, where his quickness and explosiveness, especially when he gets a head of steam, makes him a threat in transition and for lobs at the rim. Anderson doesn't do a whole lot of creating off the dribble, either for himself or for others, as his ball handling is mostly limited to straight line drives without much changing direction, and with an off hand that still needs refinement. He does do a good job of attacking closeouts, using his newfound threat as a shooter to get by his man, and having enough in terms of fakes and jab steps to be tough to defend in this regard. While Anderson could certainly stand to improve upon his relatively weak handle, which could open up a more advanced offensive role, and he could also stand to improve upon his recognition and awareness on both sides of the court, the strides Anderson has made over the last 12 months on his jump shot has been a tremendous boon for his draft stock. The improvement makes it relatively easy to see a defined role for Anderson at the next level, as guys with his defensive potential and versatility, who can also consistently hit form the perimeter, are in high demand around the league. After a solid freshman year in 2013 where he averaged 7.6 points and 3.3 rebounds, Justin Anderson's sophomore season brought much of the same. Posting season averages of 7.8 points and 3.2 rebounds, albeit in fewer minutes than he played as a freshman, Anderson's production stagnated somewhat, but he played a key role for a Virginia team that won 30 games and came up just short of the Elite Eight. With Joe Harris moving on to the pros, this season figures to be a pivotal one for Anderson, as there's room for him to have a breakout year for Tony Bennett's Cavaliers. Despite his limited progression over the last year, Anderson remains intriguing thanks to his tremendous physical tools. At 6'6, Anderson has looked the part of an NBA player since he was a high school freshman, thanks in no small part to his strong 225-pound frame and 6'11 wingspan. On top of his size, Anderson is a terrific athlete with great overall strength and explosiveness for a wing at any level. The challenge for Anderson over his first two seasons at Virginia has been translating those tools into consistent production on both ends of the floor. The team's fourth leading scorer a year ago, Anderson has functioned primarily as a jump shooter in Virginia's methodical half-court offense, also contributing with his athleticism attacking closeouts and finishing in the open floor. Good for double-figures some nights but not much in others, Anderson's sophomore year largely reinforced what we wrote about him a year ago. Perhaps the best evidence of that came in Anderson's shooting numbers, where for the second straight season, he made a passable, but far from impressive 32.1% of his perimeter jump shots in the half court. Accounting for around 60% of his total shots attempts, Anderson gets good elevation and has fairly fluid mechanics, but struggles to get dialed in from beyond the arc at times, whether he's spotting up or running off screens, which in Tony Bennett's system, can make it difficult for him to get comfortable on the offense end some nights. Almost an identical observation can be made about Anderson's shot creating ability and finishing numbers, as he remains a limited ball-handler and has shot 50% around the basket in both of his collegiate seasons. Getting tunnel vision and looking out of control at times, Anderson's strength and explosiveness allow him to finish impressively on occasion, but as is the case with his offensive game on the whole, his consistency leaves something to be desired. Despite the stagnation in Anderson's numbers, he did make some positive strides a season ago, appearing more comfortable with the speed of the college game and forcing fewer difficult shots. Though his assist numbers fell, Anderson still showcased his unselfishness and willingness to find the open man in the half court, two positives that should benefit him at the next level should his skill level continue to progress. Where Anderson has the most obvious value at this stage in his career is on the defensive end. Though Tony Bennett's team was one of the best defensive units in the country, Anderson stood out at times regardless, as his shot blocking and versatility made for some truly impressive moments. An active defender with good lateral quickness and strength, Anderson still has an occasional lapses in positioning, but is able to defend multiple positions and seems to have plenty of promise on this end of the floor. Looking ahead, this will be a key season for Anderson as a prospect, as he'll have an opportunity to get more playing time and show he can take on a bigger role than he displayed his first two years at Virginia. If he can show improvement as a shooter or shot creator, he could emerge as a viable draft candidate down the road. The first time we wrote about Justin Anderson in 2009, the then 15-year old was garnering consideration as possibly the best high school freshman in the country. Though he was unable to sustain these lofty expectations, he solidified himself as a consensus top-50 recruit and committed to an upstart Virginia program that was coming off of a trip to the NCAA Tournament. After a slow start to his college career, Anderson started Virginia's last 17 games en route to an appearance in the NIT Quarterfinals, finishing the season off on a very positive note. With that in mind, expectations are higher for his sophomore season, and scouts will be watching to better get a sense of what he can offer at the next level. Though he passes the eye test and then some at the collegiate level, Anderson's height--he stands 6'6 with a chiseled 225-pound frame -- situates him as average among small forward prospects in our database. Though he is not the tallest wing prospect in our database, he is incredibly strong to go along with a 6'11 wingspan and standout athleticism. Furthermore, reports from summer workouts indicate that he has improved his mobility, particularly by improving his balance, agility, and core strength, which could result in increased quickness in the half court to go along with his explosiveness around the basket. While Anderson's physical and athletic profiles are impressive, scouts were eager to see how he would adjust to NCAA-caliber competition. The results were decidedly mixed, as he was not particularly productive early on, but proved himself to be one of the more versatile freshmen wings in the ACC. Anderson's offensive game relies heavily on his jump shot, straight-live drives, and transition forays. He was not a particularly prolific-shot creator as a freshman, getting to the free throw line at an average rate. As a slasher, Anderson put his frame and athleticism to good use, barreling through defenders on his way to the basket and finishing well above the rim when given the opportunity. While he is outstanding running and finishing in transition, he lacks much in the way of advanced ball-handling moves, and he converts just 47.3% of his overall shots inside of the arc. Additionally, he is not the most effective finisher around the basket at this stage, despite his strong frame, making a somewhat average 50% of his looks at the rim. Ball-handling is not his forte and it is rare to see him engage his defender with advanced moves or via fakes. His mid-range game also leaves something to be desired, as he doesn't possess a very effective pull-up jumper at this stage either. While Anderson certainly does not shy away from contact, he tends to force contested shots around the basket and does not have the softest touch inside the paint at this point in his career, particularly with his right hand, which he tends to avoid as a natural lefty. Looking forward, his strength and athleticism should allow him to make considerable gains in this area  as it will for his mid-range game, as well -- if he continues to develop his off hand and hones his scoring instincts inside of the arc. Another aspect of his slashing game worth mentioning is his well above-average passing ability. Anderson's court vision as a swingman is intriguing, in part because he did an excellent job of finding teammates in transition by drawing defenders in the lane and dishing off to open players around the basket. He ranked as the fifth most prolific passer among all small forward prospects in our database with the third best assist/turnover ratio. His ability to move the ball around the perimeter, dish off the bounce, and make post-entry passes distinguishes him from other wing prospects and adds another valuable element to his game that he can hang his hat on. Though his potential as a slasher is intriguing, Anderson saw 58.2% of his offensive possessions during his freshman year as a jump shooter, making just 32.1% of his overall jump shots. His shooting mechanics are not that bad, though, as his comfort level with his jumper seemed to increase as the year moved on. Not being a great ball-handler, it will be important for Anderson to make strides with this part of his game as his career moves on, as his ability to space the floor will play a major role in the type of niche he'll be able to carve out in the NBA. Where he truly excels at this stage, however, is on the defensive end. His length, lateral quickness and strength allow him to guard multiple positions at the collegiate level, and it's not a stretch to envision that translating to the NBA level as well. Watching him run through screens, body up big men inside and outside, grab defensive rebounds in traffic, interrupt passing lanes, and block shots while trailing his man point to the versatility that he showed as a freshman and the potential that he has moving forward. The fact that he was one of only four perimeter players in our database to average at least 1.5 steals and 2.0 blocks per 40 minutes pace adjusted last season stands out as well. While he wasn't immune to making mistakes as a freshman due to his lack of experience, there is little doubt that he will continue to improve in this capacity moving forward. Anderson will be a key contributor on a Virginia team that is poised to make a run in the NCAA Tournament and should capitalize on the visibility that comes along with these increased expectations. He also will benefit from the opportunity to prove himself on a nightly basis against some of the best wing prospects in the country in a tough ACC schedule. Though he may be a year or more away from garnering significant NBA attention, expect him to rise in these rankings at this time next year if he can increase his productivity and efficiency without sacrificing his versatility. A player we've had an eye on since his freshman year at Montrose Christian, senior wing Justin Anderson (#60 Scout, #61 ESPN, #35 Rivals) made the most of the time he spent in Los Angeles, scoring 23 points en route to co-MVP honors and a win. A former Maryland commit who decommitted and then opted for Virginia last May, Anderson's current skill set is tailored perfectly to atmospheres like this one. Often breaking down into a dunk contest as so many All-Star games typically do, the Boost Mobile Elite 24 offered little evidence to combat perceptions that Anderson is the most complete athlete in the 2012 class. Built like an NFL linebacker with an unusually strong upper-body for a player at this level, Anderson is an impressive athlete who has terrific speed and excellent leaping ability. At this stage in his career, Anderson is able to make a considerable impact in transition and on the offensive glass thanks to those tools and a solid motor. Showing a solid first step and using his strength to his advantage, Anderson is a highlight waiting to happen every time he turns the corner. Right now, though, he's more adept at finishing the plays his teammates create for him. He gets a bit out of control at times when he's attacking the rim, but the positives of his assertiveness often outweigh the negatives in the high school game. To tap his potential moving forward, Anderson will need to hone his perimeter shooting and ability to create his own shot. The addition of a reliable spot-up jumper to his arsenal would help him immensely as he prepares to make the jump to the ACC. As we've noted on more than one occasion in the past, Anderson has incredible potential defensively. When he's dialed in, he has the quickness and strength to defend multiple positions and the ability to pull down rebounds at a high rate for a small forward. If he develops the right mentality, Anderson has the toughness to be an impact defender. Heading into his final prep season, Anderson has seen his national ranking drop in recent years, as recruiting analysts have not seen the type of improvement skill-wise they may have hoped from him, but he may have the most college-ready body in high school hoops, which can't be taken for granted. Considering how he performed at the Boost Mobile Elite 24 game and scrimmages, the book on Anderson's long term potential looks far from being complete. While obviously it's way too early to be talking about a player who just finished his freshman year of high school, it was tough not taking notice of the talent that Justin Anderson displays. Not only does the lefty bring great physical tools to the table, highlighted by a great frame, wingspan and athleticism, but he also looks to be a very smart, tough, active player with a pretty nice stroke. He competed non-stop, defended extremely well and also did a great job crashing the glass. Already ranked by ESPN as one of the top five players in the 2012 high school class, Anderson has quite a future ahead of him if he continues to work hard and doesn't let the hype go to his head. It's always tough to start making predictions about how extremely young players are going to pan out, but Montrose Christian freshman Justin Anderson (#1 ESPN) shows too much potential to not get a mention. Right off the bat, he does not look like a freshman physically, but more like a senior who is going to be playing at the high-major level somewhere next year. Anderson has good length and is freakishly athletic for a player his age. Offensively, he still has a ways to go and this is where he shows his age the most with his indecision at times. The lefty has the ability to make shots from the perimeter but his jumper is inconsistent at this point. He looks more comfortable going to the basket, something he was able to do on a few occasions, where he can elevate with anyone in the country. At this point though, Anderson primarily defers to the plethora of talented teammates he has playing with him, as a sophomore next year he will likely become a bigger part of the offense. On defense is where the freshman really stood out. Anderson was charged with the responsibility of guarding Avery Bradley in his second game, and though the All-American was able to get his points, it wasn't easy. Anderson has excellent lateral quickness and a long wingspan, making him exceptionally difficult to beat off the dribble. He is an explosive leaper and showed so by blocking a pair of shots off the glass, several inches above the box. Its way too early to being to speculate how far Anderson is going to go with his basketball career, but the future certainly looks bright for the freshman from Virginia.